Very important! If you are looking up our location on your own map app, make sure to enter the street address with suite number exactly as written above! We are in the 3 story white building with the black outdoor staircases. 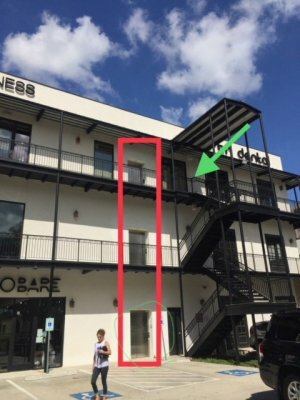 The red rectangle in the photo indicates the front side elevator location and the green arrow points to our shop. Take the front side elevator and it will open directly to our door on the third floor. There is also a back side elevator. If used, take a right when you get off and walk around to our front door. Parking is available all around the building. Free covered parking is available in the garage. 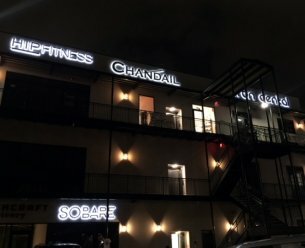 Accidentally at our old location? Here is a Google map from there to our new shop! We are only 3 miles away! 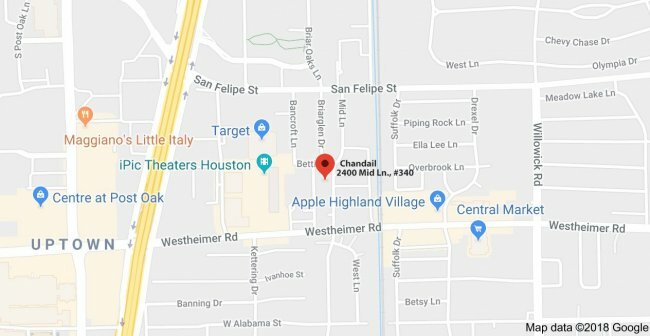 Chandail is open for shopping on certain Sundays. See the lower pink bar on the home page under Stitch-In with Saira. Special Shop Hours will be located on the home page. Please call the shop (713-524-6942) or Saira (832-209-6567) for questions. Please complete the information below and submit. We will contact you as soon as possible! Would you like to receive our email news?